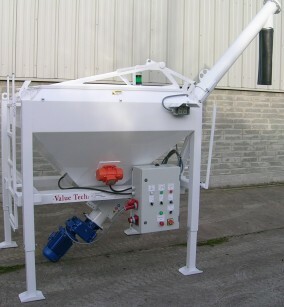 Powder Dosing Silo | Mobile Dosing Silo | Powder Feeder - Value Tech Ltd. The Value Tech Mobile Dosing Silo is a precision volumetric powder dispenser with an infinitely variable delivery capacity up to 20 tons per hour. This process is achieved by both the variable auger rotation speed and running discharge time. 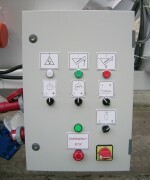 A digital read out (DRO) which has a magnetic base display both preset time and speed can be attached to the silo frame in a position where it can be easily viewed by the operator. 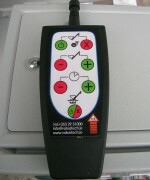 Both settings are made and revised as necessary either on the main control station of the unit or on a radio remote wireless control transmitter which the operator (machine driver) keeps with him to control the dosing value. Vibrators fitted to the silo inclined walls which ensure the consist flow of powder can be activated by either control station. The dosing silo can be easily be positioned on site by either set of forks or suspended from above. It is equipped with four adjustable height feet to assist transportation within legal height restrictions. The hopper is fitted with a water tight hinged cover which can easily be opened from the ground and locked in open position to prevent inadvertently closing by wind etc. Positioned inside the hopper is a heavy duty serrated and removable cutting knife to open big bag powder, cement etc. A safety grid prevents any waste plastic or other unwelcome materials from entering the chamber. 380V Electric Motor + Reduction Gear 2.2KW 2.2KW.